The TAHMO Initiative regards training and education of both teachers and students of schools with a TAHMO station as a very crucial ingredient of the Initiative. This is done through the school2school program which is created to serve this important purpose of educating, training and support with teaching and learning materials. Students and Geography teachers of St. Paul’s SHS, Denu in the Volta Region of Ghana had an interactive session to understand TAHMO’s school2school program. 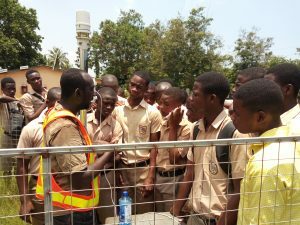 The students joined Mr. Kwame Anhwere – the TAHMO regional coordinator – to carry out maintenance work and understand all the ins and outs of the weather station. This attracted students from other departments which found the session quite interesting. During the sessions, the main discussion was about how the environment supports life and the importance to take good care of it. It was about the activities and responsibilities that individuals and governments have to minimize their impact on the environment. The last part of the discussion centered on the various sensors on the station, how they work, the parameters being measured and how data could be accessed and visualized for lesson plans. 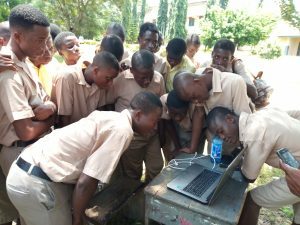 The students had the opportunity to see the real-time measurements when the station (logger) was connected to the computer as well as near real-time measurements online via the school2school.net platform. Some of them had the opportunity to check the data online. The school expressed their appreciation and were happy to be among the selected schools in the country to host a TAHMO station.